Ecologically or Environmentally Sustainable Development (ESD) is part of our client-architect conversation from the earliest brief development stage. Discussions about green initiatives, performance criteria, comfort levels, materials, siting, eco design and environmental concerns have implications on the ecological sustainability of the building. 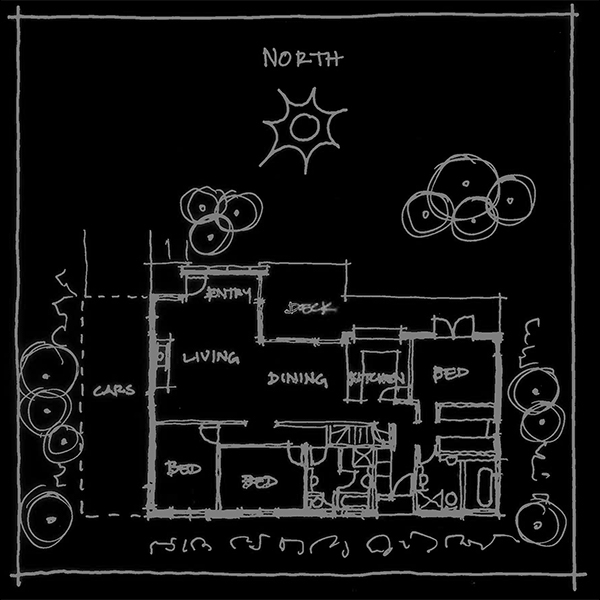 We present our clients with project specific options that inform the project brief. Once a brief is established, ESD issues continue to be considered as we move through each of the project stages. 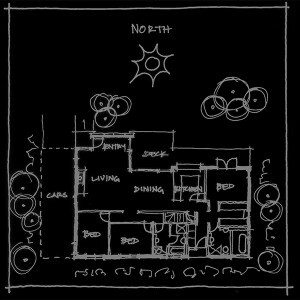 Through design development, documentation and construction, issues of sustainability are integral to the decision making process. Our approach aligns with principles of ESD design, where we consider the long term environmental impact of each project and recognise our responsibility to understand our ecological footprint on the planet. Green awareness, over population, industrialization and an increased damage to our environment make it imperative to search for new building solutions that are environmentally friendly and lead to a reduction in the consumption of materials and energy. We design to provide comfortable conditions minimising energy use and greenhouse gas emissions. 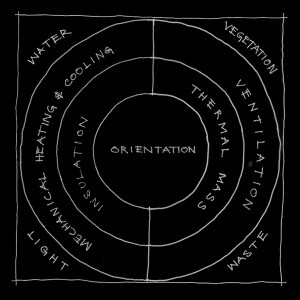 The buildings perform in relation to different weather conditions through controls of openings, shades and vents. Breezes can be captured or excluded, heat can be exhausted, and warmth trapped by appropriate window systems, in addition to insulation and thermal mass. Rooms are located to suit all site elements internal planning configurations and climatic conditions maximising passive solar benefits. Highly thermally massive materials are used, where appropriate, in floor slabs and internal walls to moderate seasonal and daily temperature fluctuations within rooms. 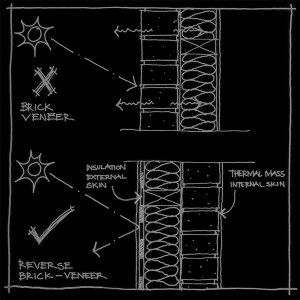 External thermal mass walls are protected from ambient atmospheric conditions by an external leaf of insulation (reverse brick veneer) – minimising thermal impact on the internal mass. Building material selection is made to ensure long life and low maintenance while maintaining the lowest environmental impact levels, and assisting in thermal performance – and beauty! We select from a wide palette of materials including timber, rammed earth, concrete block, pressed earth blocks, straw bale, concrete floors, timber structural framing, and lightweight metal roof sheeting, and the list goes on. 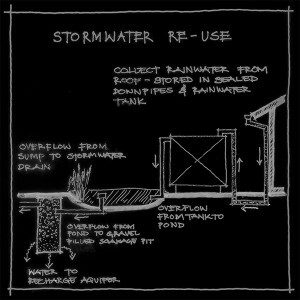 Timbers are selected from sustainable sources. Recycled materials are valued and included where possible. 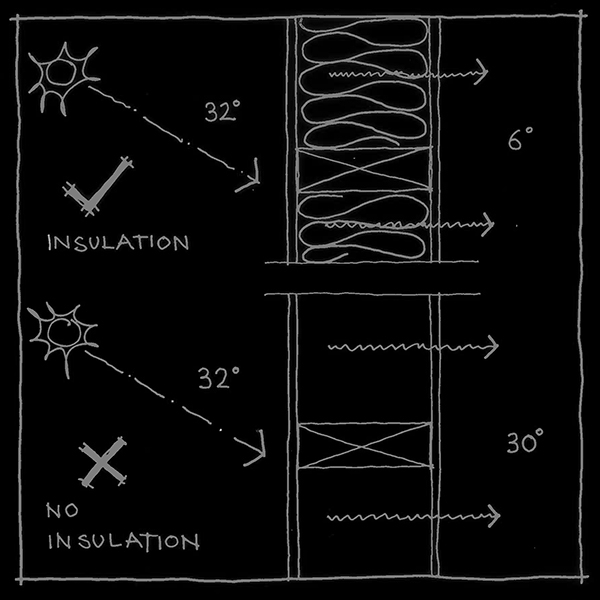 Roofs, walls and suspended floors with effective levels of bulk and foil insulation will significantly reduce heat transmission. 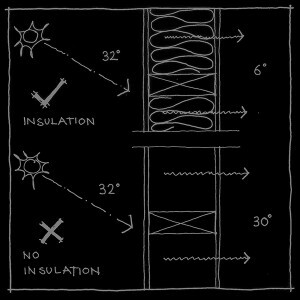 Preventing heat gain in summer, and loss in winter is fundamental. 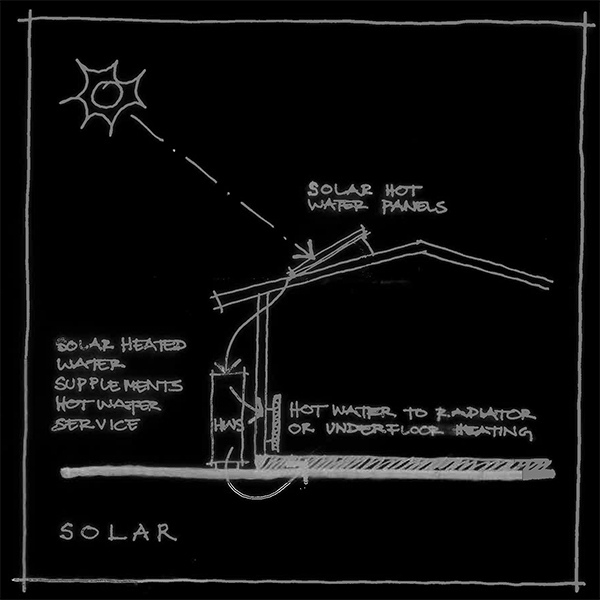 Solar heated water for domestic use is recommended. Low energy and sustainable methods of heating in conjunction with effective building design will considerably reduce energy use. 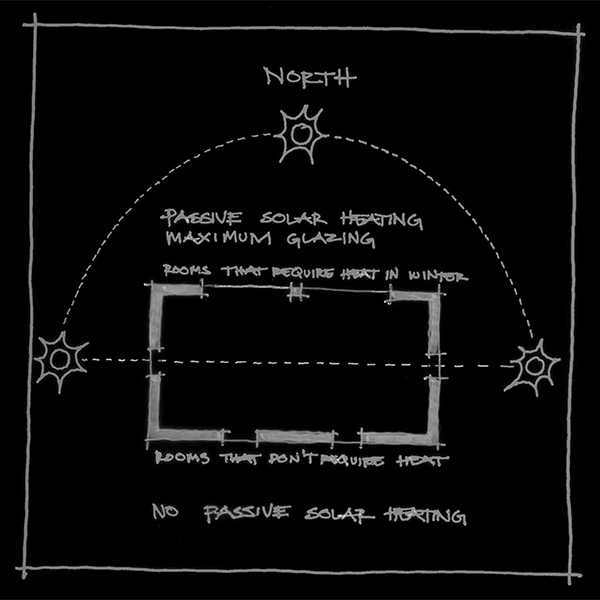 Thermostatically controlled hydronic in-floor heating may use solar hot water (boosted where necessary). Windows and doors are arranged to maximise cross flow ventilation. Summer breezes flow across spaces, driving hot internal air to escape through high level windows. 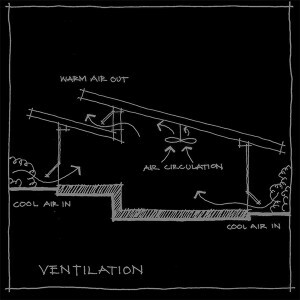 Vertical column movement allows air to exhaust naturally at high level, with cooler, low level air drawn in replacement. 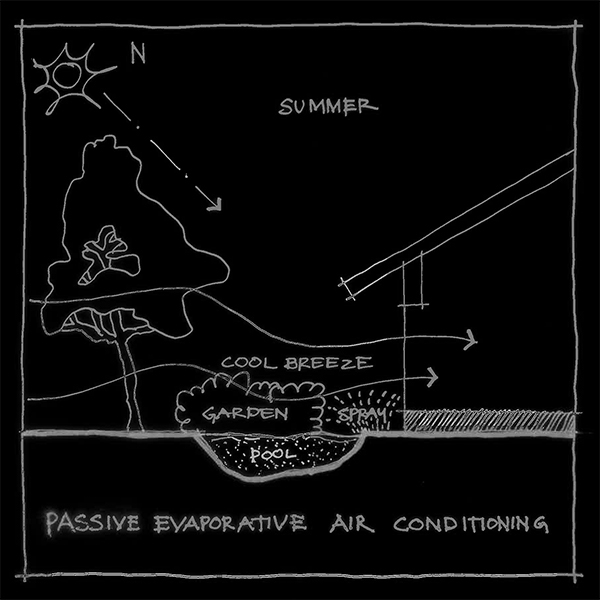 The creation of micro-climates in areas around the building assist in the movement of warmed and cooled air. 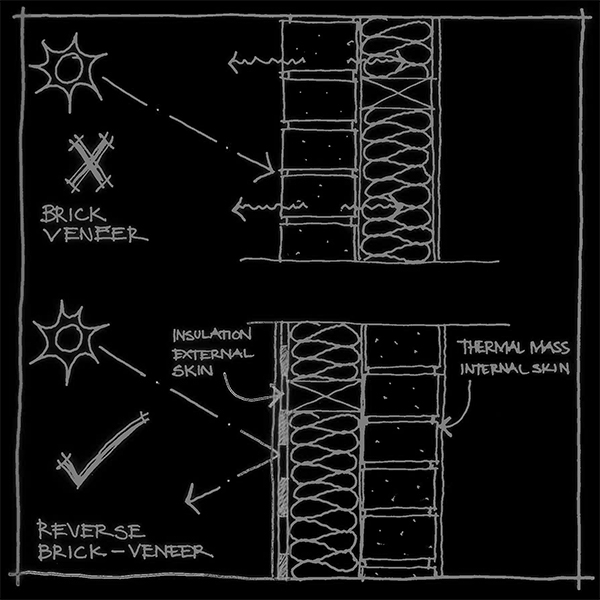 Reverse block veneer places the thermal mass inside the building. In winter, they store built up heat from windows and/or heaters and radiate it back into the room as the temperature drops. 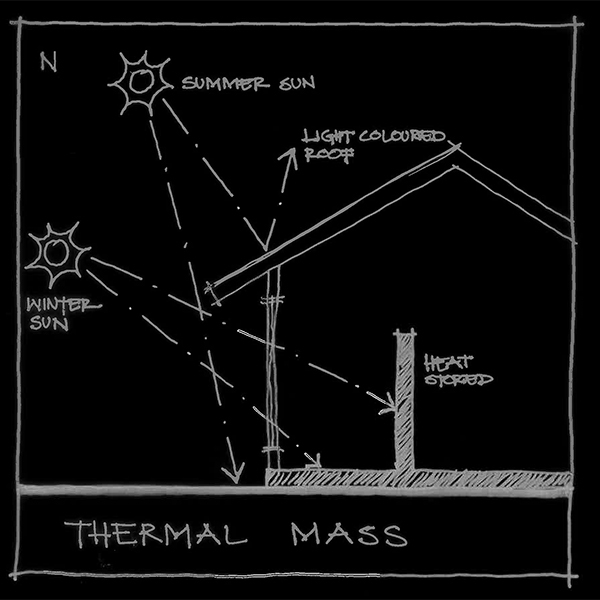 Thermal mass absorbs heat from the air in summer while windows and doors are closed, and nightly open windows allow cooling air to purge pent up heat in the mass. 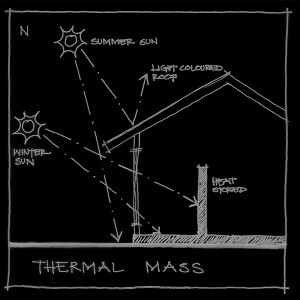 The external cladding and insulation isolate the mass from external ambient conditions, stabilising the temperature of the mass. 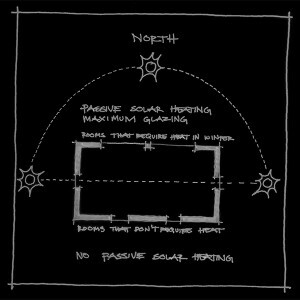 East and west walls are particularly vulnerable to massive heat gain in summer, and are ideally shaded. 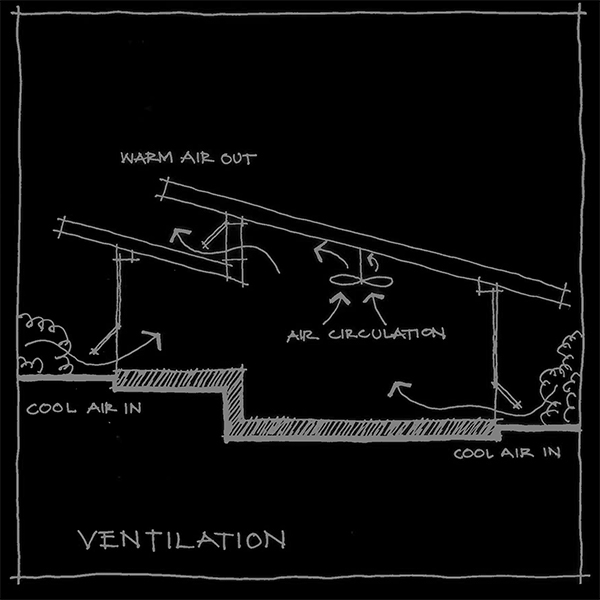 When shade is not available a ventilated walling system is employed. Face material is separated from the wall allowing air to circulate in the formed space. A skin of reflective foil, fixed over the insulated leaf, reflects radiation and provides additional weathering. 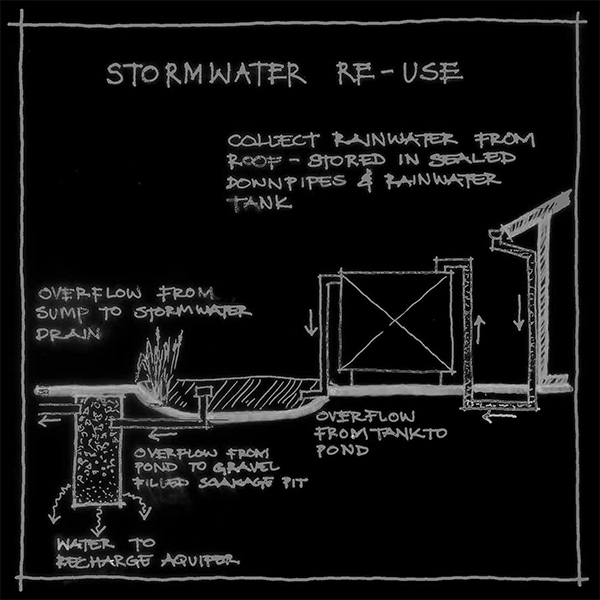 Rainwater collection, storage and use is considered as relevant to anticipated frequency of rain events. Pumps and valves ensure continuity of water delivery, and maximum space in the tank to collect the next rainfall. Overflow water can be used in ponds and other landscape features like drainage swales to monopolise the water on your site, and thus reduce water sent to the street (sea). Tap ware, WC cisterns, and shower heads are selected to reduce the outflow of water to a minimum without compromise to your daily experience. 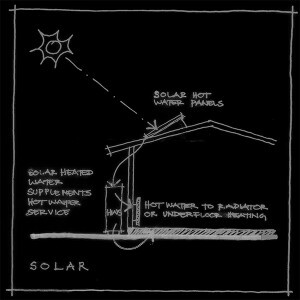 Ceiling fans; cool pipes (pipes buried under the building to utilize the thermal mass of earth to naturally cool the air); low energy evaporative, and indirect evaporative, coolers; and in floor hydronic cooling may be combined to assist in the provision of comfort in summer. The way the landscape integrates with the operation of internal and external spaces is an important consideration. 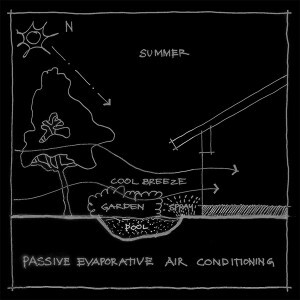 Cool gardens can provide cool air for internal spaces as well as an outdoor refuge from hot weather. Planting selections consider minimal water use and are often integrated with water re-use systems in the form of ponds and swales. Paints, polishes, and other finishes are selected for long life, washability, wearability sustainability and health. Low and no VOC (volatile organic compound) paints are specified as are natural, low maintenance, durable products. Minimising waste is a priority throughout construction and in the performance of the building. The approach to waste is ingrained into office procedure, to instructions to contractors, and encouraged through recommendations to clients. Systems, services, and appliances are utilised to maintain minimal waste generation.